At long last, the new edition of the Storytelling game of Savage Fury, Werewolf: The Forsaken 2nd Edition featuring the Idigam Chronicle, is now available in PDF for your ravenous, blood-soaked claws. You are a hunter now, one of the Uratha who inherit the blessings of Moon and Wolf. You conduct your sacred hunts in the shadows of the ordinary world, trying to maintain the boundaries. Driven by the need to hunt, you must keep the forces that would sway you in harmony rather than giving in to your instincts. But the hunt isn’t easy. Your werewolves think they can hunt any prey, but they now face the return of the idigam — incomprehensible spirits of things that never existed, imprisoned at the dawn of time. Now they’re back, and they want to kill their jailers. They hate you, and they’re coming for you. Time to show them that your senses — and your teeth — are as sharp as ever. 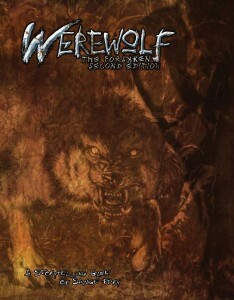 The complete guide to playing a werewolf in the World of Darkness. Reimagined tribes, auspices, and spirit magic to create the ultimate predator and her pack. A brand new look at werewolf hunting grounds around the world, from Basra to Tokyo. Rules for the werewolves’ prey, and five examples of the idigam. Strange that this did not have a kick starter. World of Darkness: The God-Machine Chronicle didn’t have a Kickstarter. Blood & Smoke: The Strix Chronicle/Vampire: The Requiem 2nd Edition didn’t have a Kickstarter. Why is it strange? It was never supposed to have one. It should be noted that after the release of VTR2 we got a lot of people telling us that they didn’t like VTR but loved VTR2. 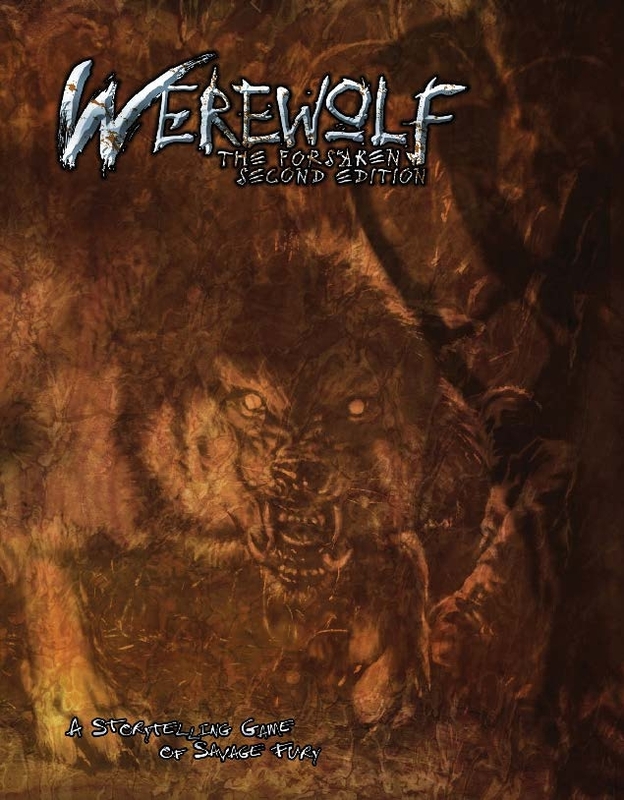 So while you may not have been a fan of either Werewolf game before, I think it’s definitely worthwhile to take a look at Forsaken 2e. I am one of those people. The original felt a bit hollow, like a D&D player’s guide: all rules, no clear idea what to do with it. I’m older than I was when I picked up Requiem for the first time and can see more potential in it, 2e has direction: dozens of them really. Every page practically has a gripping hook for a story to say nothing of the write ups for the Strix, each one almost a complete adventure in and of itself. I think it benefits from years of experience with Requiem and I look forward to seeing what has been done with Forsaken, a game I already liked. When is the POD going to be released? Please see the Print section of our FAQ page. Awesome! I look forward to getting my claws (Ha-ha, see what I did there 😉 on a physical copy of this. But I’m REALLY looking forward to Changeling: the Lost Second Edition! That’s a defiant must have for me. YESSSS. I want to run this now, it looks fantastic. This makes me so excited in so many ways. I’m not into PDFs but when this hits PoD I’m going to be on it like a Storm Lord in a Storm. Skolis-Ur be praised. I just picked this up on PDF. The first thing I’d like to remark on, is how great the art is. From reading the updates you all provided during development, I took it that there was a small issue with getting the artist you wanted lined up for this project. I’m not sure what the end result was, or how you all resolved it, but the product is stunning. Kudos and more kudos to the art team. Fantastic job. You really created an atmosphere with the art that I think captures the essence of what it means to be a werewolf in the World of Darkness. I’m sure there will be more kudos once I get to sit down and actually read the book. Great job! Yes! Thank you, Onyx Path! Hey um, not sure if this is just DriveThruRPG, but I bought the PDF and pages 94 and 95 were switched around. The text was wrong, though the numbers were right…oops! Well, you can be forgiven an occasional drop of the ball! Errata are being collected on this forum thread. Thanks! Seriously, though, cleaning up older games and bringing a fresh eye to them is a really cool idea. I always think good things can stand to get a little better. Click the “Current Projects” link in the menu at the top of the page for Mage status. It’s also covered weekly in Rich’s Monday Meeting blog. The Cahalith will tell stories of this day. If I contributed to the Dark Eras kickstarter for the add-on good for a new World of Darkness 2nd Edition pdf, any idea when the add-on will be available so I can use it to get WtF2? That Add-on is for the nWoD 2nd Edition Core Rulebook. Not for any other 2nd Edition. Crap, I’m an idiot. I thought it was an add-on for any 2nd Edition. Which means I contributed for 3 add-ons of the same thing. Sad trombone. Luna be praised! I have a lot of work to get through tonight, but the cursory glance I took has ensured that I will be running this with my roommates as soon as lupinely possible! never been a big fan, but I’ll pick it up in solidarity, sure, and maybe I’ll like it better this time around. have you guys hit platinum? What are the chances you’ll be releasing an MET guide for this so it can be played Live Action? Zero percent right now, the license for Live Action WoD(s) is with By Night Studios. I understand they have talked about rules for nWoD properties, but they are pretty well busy with their current line-up of planned projects. That’s what I thought but I figured I would ask. The BNS stuff has been as fantastic for OWoD as 2ed has been for NWoD. Like Rich said. Onyx Path only has the license to do tabletop material. LARP is out of our wheelhouse. Is this just like VtR:2nd Ed to where it has all the rules to play the game or do I still need the WoD core book? It’s like Requiem 2E, with all the rules. I bought a pdf the day it came out and I love it! the new facet system of gifts and the new hunt focus on each of the tribes was awesome! 2nd edition NWOD has been awesome so far! can’t wait for more previews & tidbits for Promethean, Mage & Changeling 2E 🙂 Really hoping for 2E books for Geist, Hunter & Mummy too, but really glad for what’s been announced so far. Does this version of the book come with the basic rules found in the core book or will we still need the core world of darkness book in order to reference? As stated in Dustin and Marin’s exchange a few comments above, it’s a standalone book.